Taiwan’s temperate coniferous forest belt with near ever-present cloud cover and high annual precipitation boasts species of Calocedrus, Chamaecyparis, Cunninghamia, Photinia, Schima, and Rhododendron. Henry John Elwes, noted British author, botanist, entomologist, and lepidopterist was perhaps the first Western dendrologist to see Chamaecyparis obtusa var. formosana in the wilds of Taiwan. Two species of Chamaecyparis are found on the island: C. formosensis at lower altitudes and C. obtusa var. formosana occurring at higher elevations. H.J. Elwes noted that the two could be distinguished from one another with the latter bearing brighter green foliage. 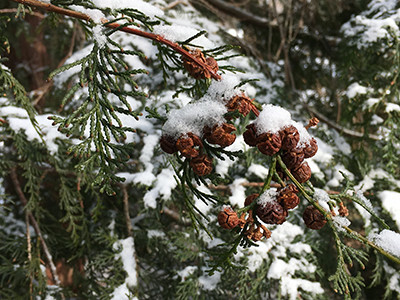 Botanically, Chamaecyparis obtusa var. formosana can be distinguished from C. formosensis by the shape of the cones (globose vs. oblong) and by with number of seed scales (8-10 vs. 10-13). The first recorded introduction was in 1910. However, only one seed germinated and it is unclear whether this initiated the introduction of the species to cultivation. Further expeditions by Edinburgh and Kew have resulted in several more collections being made. The first specimens arrived at the Scott Arboretum from Longwood Gardens. 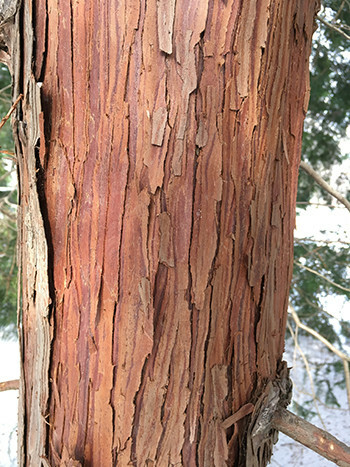 The pyramidal conifer is slow growing with fine, ferny sprays of foliage. The rich green color can bronze during winter, especially on younger plants. The eastern United States has been conducive to planting as its high humidity and ample rainfall mimics the species native Taiwan. Chamaecyparis obtusa var. formosana is currently listed as “vulnerable” on the IUCN Red List of Threatened Species due to deforestation. 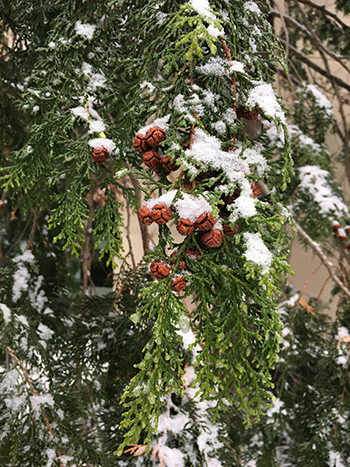 Chamaecyparis is particularly prized for its wood. An estimated 30% reduction in population has occurred over the span of three generations. While reforestation efforts are underway, fear is that this loss may not be reversible due to habitat degradation and replanting with faster growing taxa. 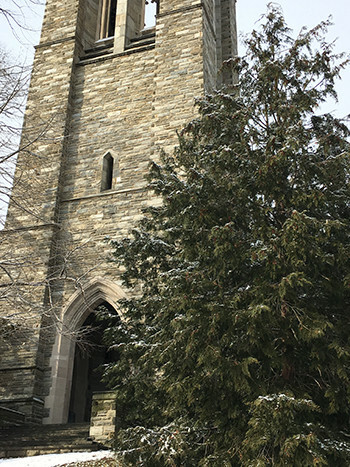 The Scott Arboretum currently has nine accessions with the oldest planted in 1984. 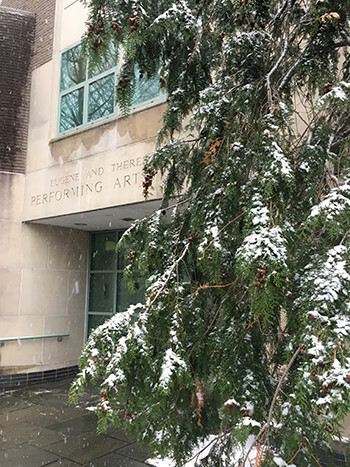 A specimen can be seen by the Lang Performing Art Center and another along the north side of McCabe Library. 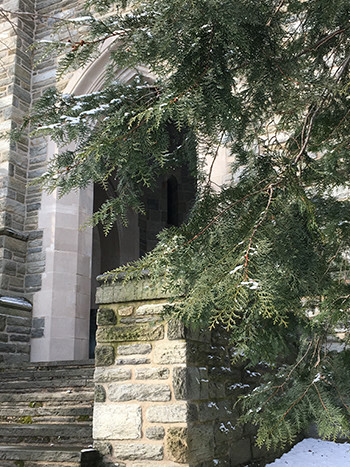 Cluster plantings are near the Clothier Bell Tower and in the Pinetum. Chamaecyparis do extremely well here in southwestern Nova Scotia , Canada. We have moderate winters and summers and enough rainfall. They are all amazing plants with very few problems. They are so diverse and beautiful. I have never seen this species before, nice replacement maybe for hemlock as we are losing those to a pest. Thanks for the article.